Focus on the problems that most commonly plague PC users and fix each one with a step-by-step approach that helps you understand the cause, the solution, and the tools required. Discover the connections between the different hardware and software in your devices, and how their bonds with external hardware, networks, and the Internet are more dependent than you think, and learn how to build resilience into any computer system, network, or device running Windows 10. 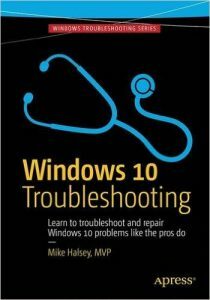 If you’re fed up of those nagging day-to-day issues, want to avoid costly repairs, or just want to learn more about how PCs work, Windows 10 Troubleshooting is your ideal one-stop guide to the Windows 10 operating system. You can buy this book from Amazon and good booksellers.